An original 1968 Fiat 500 F Berlina has joined the New York Museum of Modern Art to celebrate its 60th birthday. The Fiat 500 on July 4th. One of the most seminal superminis ever made alongside the original Mini and Volkswagen Beetle, the 500 effectively mobilized Europe after the war. To this day, its design remains iconic – but you don’t just have to take our word for it. To celebrate its legacy, an original example of the 500 has been added to the New York Museum of Modern Art collection. So now you can say the Fiat 500 is officially a work of art. The car on display is an immaculate 1968 Fiat 500 F Berlina, the most popular model in the range built between 1965 and 1972. "While the Fiat 500 has unquestionably left its mark on automotive history, it is equally true that it has never been just a car", said Olivier Francois, Head of Fiat Brand and Chief Marketing Officer FCA. "In its 60 years of history, the 500 has transcended its material manifestation to enter the collective imagination and become an icon, which has now the honor of being certified by being acquired by MoMA in a tribute to its artistic and cultural value". 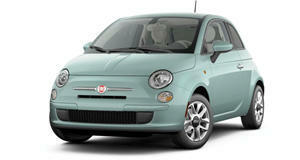 Its 18-horsepower produced by its 500 cc engine may seem modest today, but its low cost made it a best-seller in Europe. The Fiat 500 is an icon of automotive history that fundamentally altered car design and production" said Martino Stierli, The Philip Johnson Chief Curator of Architecture and Design at MoMA. "Adding this unpretentious masterpiece to our collection will allow us to broaden the story of automotive design as told by the Museum." During its initial 18-year production run between 1957 and 1975, over four million models were sold worldwide, making it one of the best-selling cars of its time. The reborn Fiat 500 , but it’s a best-seller in Europe, ranking first in eight countries and among the first three in six others. Two million units have been sold since it launched in 2017.